Butcher, Baker, Candlestick Maker. These three cards (especially the first two) make the set for me. I smile when I see the Baker in the mix because she changes everything. Thank goodness those roving barbarians are gone. Now we can focus on building. Our empire was in shambles, but the industrious spirit is stirring once more. 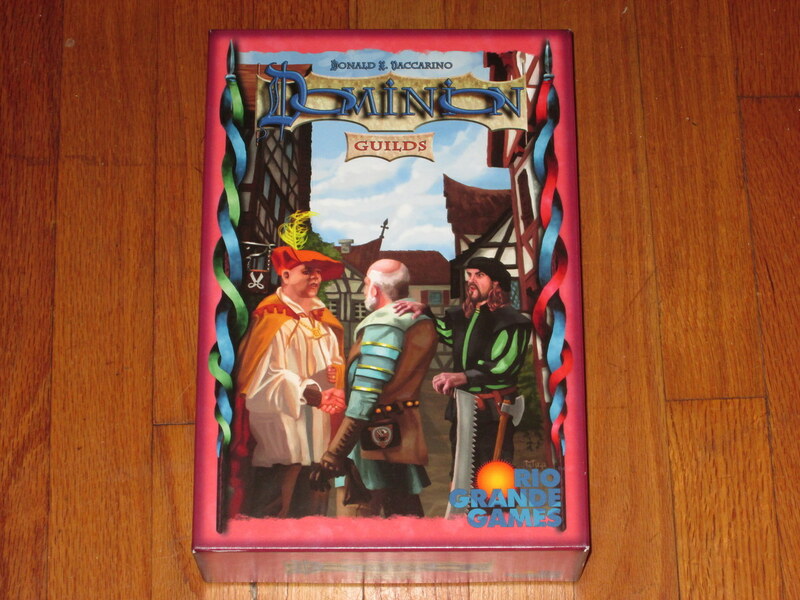 Dominion: Guilds is an expansion to the Dominion deck-building game, so you need either a base game (the core set or Intrigue) or the base cards to play it. The rules are the same as the base game (see our review), with two new concepts. The first concept introduced in Guilds is coin tokens. Coin tokens are like treasure cards except that you can store them up from turn to turn, waiting for the most opportune time. During the buy phase, you can add as many coin tokens to your treasure as you’d like to bolster your buying power. Some cards give coin tokens; some use coin tokens in a different way. The second new Guilds concept is overpayment. Several cards in the set give you a bonus if you pay more for them than their printed cost. Overpayment only happens during the buy phase (so you can’t “over-gain” with Feast or something), and the overpayment effect is a one-time at-purchase effect. 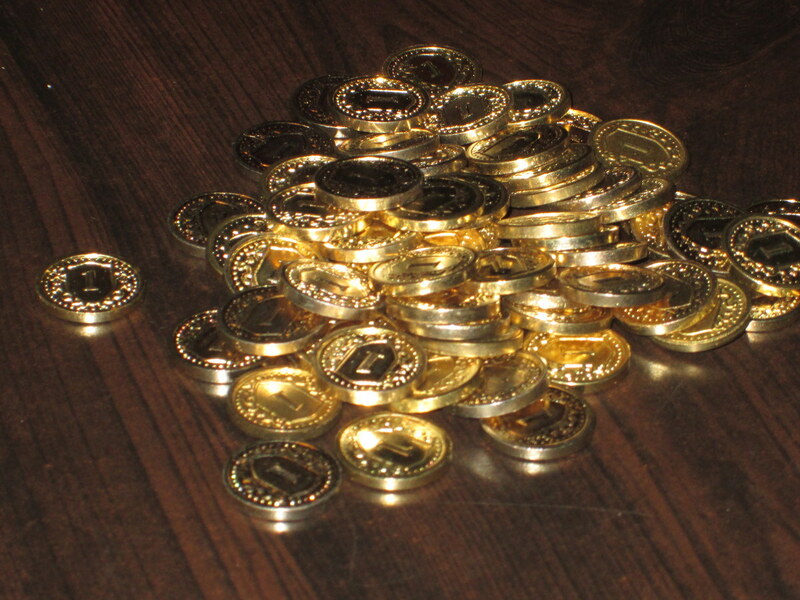 A pile of coin tokens! No, Guilds doesn’t come with this many. But when you add together the tokens from Guilds, Seaside, and Prosperity, you realize you’re almost ready for your own Money Bin. High-Powered Career, or Dead-End Job? I don’t know why, but it’s fashionable these days to disregard Dominion. It’s criticized (unfairly, in my estimation) as multiplayer solitaire. It’s themeless (partially true). The slew of imitators has supposedly diminished the original. (They haven’t.) Then there’s the expansion fatigue–box after box of new cards to buy. Guilds, the latest (and last) expansion for Dominion, has arrived at an inauspicious time. And yet it has the potential (as most Dominion expansions before it) to reinvent the game. I’m not using hyperbole here. Guilds really is a revolution for the game. There are a few reasons for this. The first is that (similar to Hinterlands) it has the potential to alter the opening hands, which alters the course of the entire game. Every player of Dominion knows that there are only two possibilities for opening hands: either 4-3 treasure, or 5-2. Hinterlands introduced Nomad Camp, which, when bought, goes on top of your deck, thus potentially changing the opening rounds of buying. And Mandarin, which when bought puts the treasure used that round back on your deck. In Guilds, Baker gives each player a “taste” of a coin token to begin the game, changing the dynamics of what’s on offer. This simple and subtle change doesn’t seem like much, but it completely changes the considerations players must make at the beginning of the game. Now hands can be 3-5 or 2-6 or 4-4 or 3-5, and those changes make a huge difference, granting access to cards that in other sets would have been available only on the third and subsequent rounds. These cards give a special bonus when you overpay. Similarly, overpayment changes the way players think about what they have to spend. No longer do they have a truncated set of options, at most the ten kingdom cards and the supply cards to choose from. Instead, with overpayment, players can decide to buy one lower-cost card and make it awesome through its bonus effect. With multiple buys, players can decide how much to overpay, and when you combine this with the Baker, again, more possibilities open. And often the overpayment changes the game. 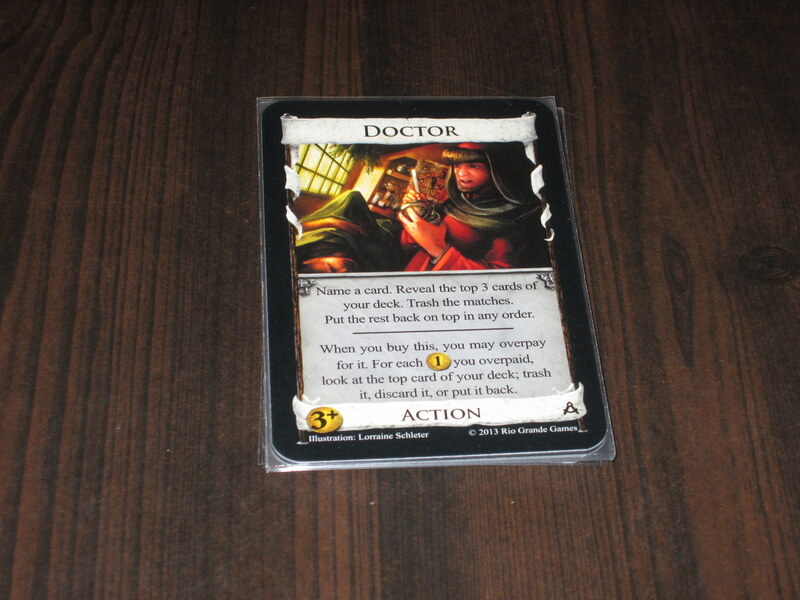 Doctor, for example, can eat through your early deck. Masterpiece, while not very powerful on its own, can load your deck with silver at the right price. Stonemason can give you the engine cards you need if you can afford to overpay. And Herald can set up your next turn exactly how you want it to be. These considerations aren’t the simple ABCs of early play, but they develop the game in a new and interesting way. The good doctor. Get rid of curses, coppers, estates, or whatever, as long as you pay the right price. Guilds, while being a small expansion, has several variations on the new concepts, which are very welcome. The Butcher, Baker, Candlestick Maker (good one, Donald X. 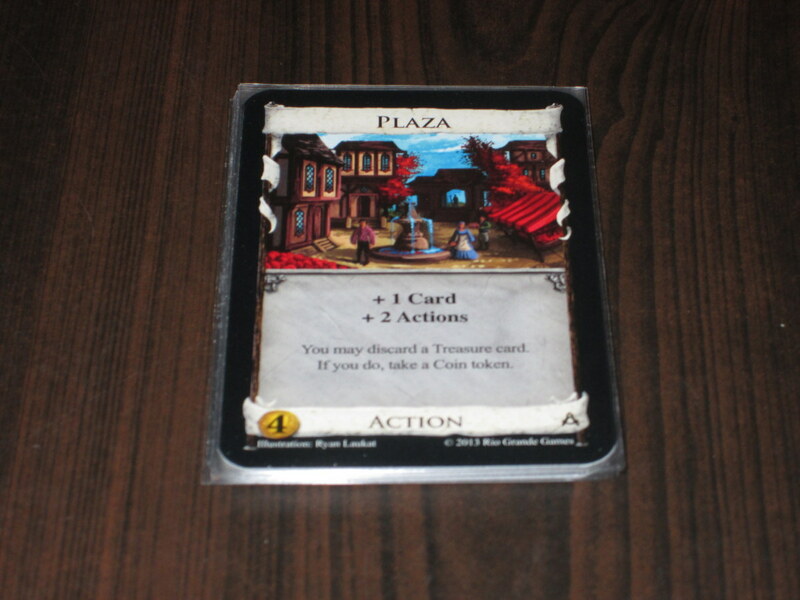 ), Merchant Guild, and Plaza all offer ways for players to get coin tokens. The Butcher even uses them differently, earning players two coin tokens but then offering the prospect of a remodel, with each coin token increasing the potential of the upgrade. Baker seems so unassuming–a simple +1 card/+1 action–but the ability to take a coin token with each Baker played is kind of incredible, especially in the early game. 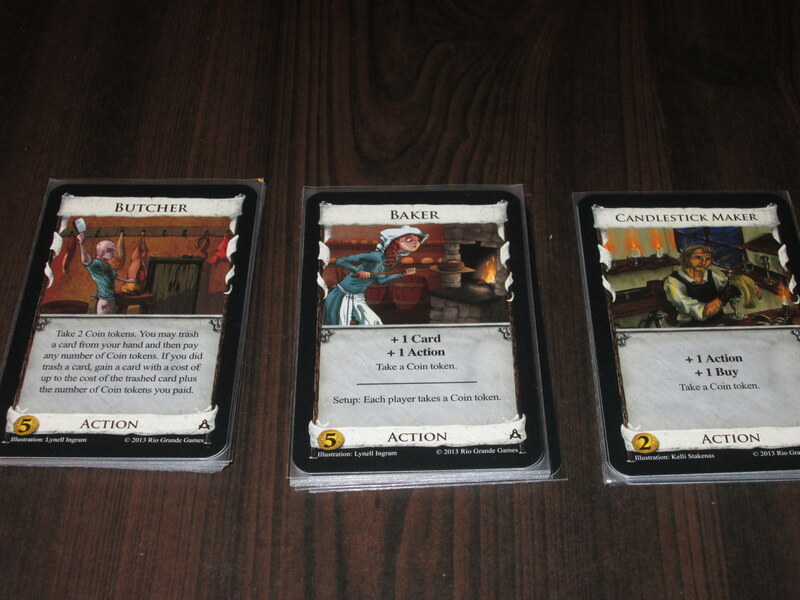 (And hey, now that you get a coin token at setup, you can buy Baker in your first two hands no matter what you drew.) Similarly, the overpayment effects for Doctor, Herald, and Masterpiece are very different but all thematically linked. New (and nasty) attacks. These are very fun cards to play with. 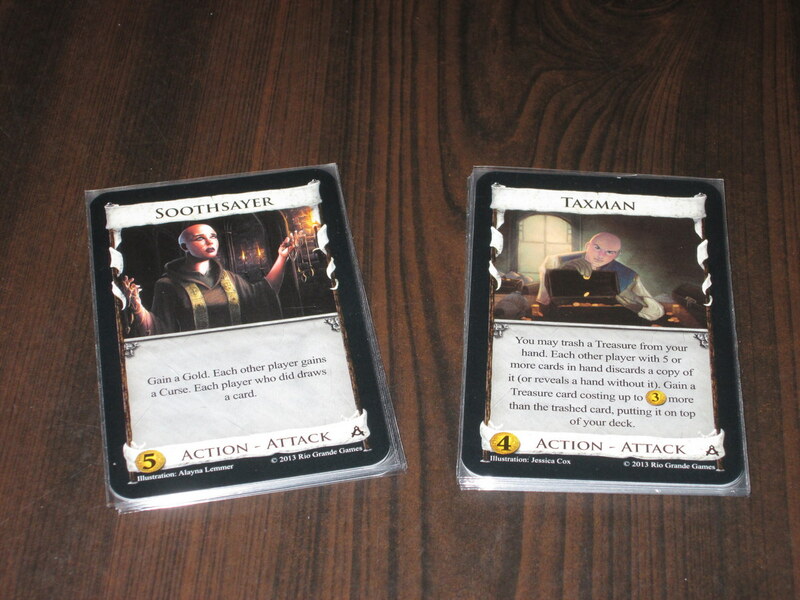 Guilds has two nasty attack cards, Soothsayer and Taxman. Soothsayer is a cursing attack that gives you a gold at the cost of giving your opponents a free draw. Taxman is an amalgam of Mine, Bureaucrat, and Cutpurse–he can be especially frustrating to play against if you keep drawing just enough money to buy what you need. Both attacks are welcome additions to the game and feel different from what has been offered to this point. 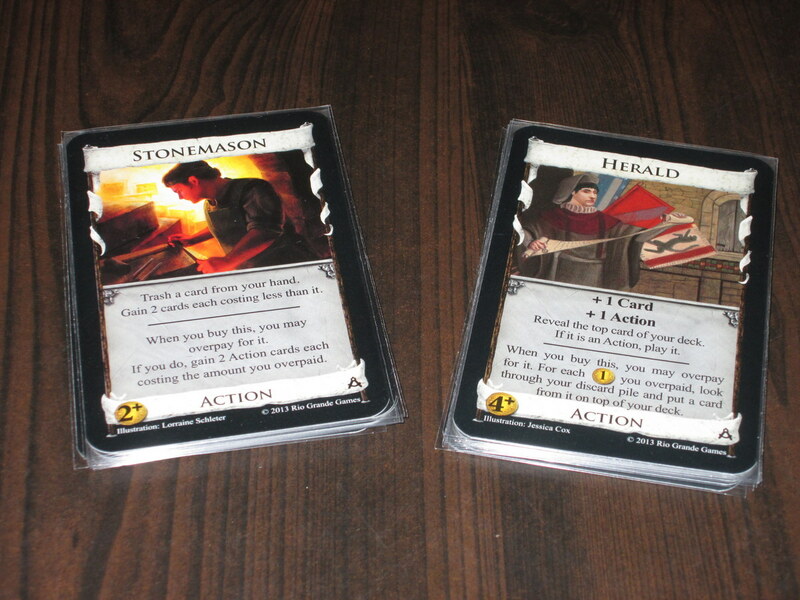 Dominion’s main attraction is how well the cards from various sets play together, and Guilds fits in seamlessly here. No matter what set you’re using, Guilds provides a welcome complement. Coin tokens and overpayment, unlike, say, Potions (poor Alchemy…), can be useful no matter which expansions are integrated. Obviously, some interactions will be more attractive than others, but that’s the way any random setup will be. My favorite expansion to pair with Guilds is Prosperity, since both sets manipulate money. It’s fun to see the new ways to use old cards in light of what Guilds offers. The caution I give each time we play is that Guilds, while being a very fun set of cards to play with, can be distracting. Of course, it’s the same with every expansion: you forget about the goal and instead want to try new means. I have fallen into this trap so many times, buying Baker after Baker while forgetting that my goal was to get Provinces. I would also caution that while Guilds is not as difficult to parse as Dark Ages, it is not an easy set for beginners to learn on. The reason is that Guilds opens many more possibilities for cards, and several cards in the set have a primary and a secondary ability that can be hard for newer players to manage. Experienced players (even moderately experienced players) should have no trouble jumping in, though, which illustrates the brilliance of the design. What would a new set be without some variation on Village? It’s hard to review new Dominion expansions because once you integrate the cards into your set, you feel like they’ve always been a part of your collection, and Guilds is no exception. While the concepts of coin tokens and overpayment are new, they fit so seamlessly into the Dominion system that they seem more like old friends than the new and shiny set. Yet on the other hand, each new Dominion expansion also has something that is radically new about it. The concepts feel old, but they bring fresh winds of change to staid old ideas. Even if you’ve seen Dominion 999 times, in some respects you will see it for the first time with Guilds. Guilds is not as essential as, say, Intrigue or most of the other big-box expansions, but it is an incredibly fun mix of cards to spice up your games. Dominion is not crawling across the finish line here. Guilds is a strong expansion to end the cycle. I am content.